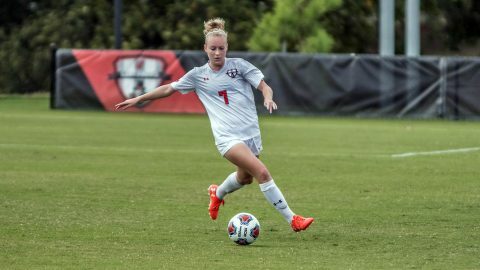 The Govs got off to a shaky start, struggling to control possession in the midfield, but the back line held strong, fending off Morehead State’s (2-13-1) five shots and never giving the Eagles a corner kick. Sophomore keeper Mary Parker Powell was not called on often in Sunday’s match, but stayed alert directing the back line. Powell made one save in the first half on a dipping ball off a set piece that she read and tipped over the bar just before the ball crossed the line. The Governors came out of the halftime pressing Morehead State creating turnovers and dictating play in the midfield. The Govs earned three corner kicks in the second-half and fired nine shots at the Eagle’s junior keeper Michelle Washburn. Senior forward Kirstin Robertson opened the scoring for the Govs in the 76th minute on a through pass from redshirt sophomore Pamela Penaloza. Penaloza’s pass hit Robertson in stride as she took a touch around an Eagle defender and slotted the ball in the far left corner. Morehead State looked desperately for an equalizer, throwing numbers forward, but the Governors’ defense stood strong repelling balls dropped in over the top back towards the midfield. In the 84th minute, junior McKenzie Dixon put the match away when she picked up a ball dropped over the top of the Eagle’s defense from junior Katie Costantino and launched a shot off the keeper’s hands and into the back of the net.